From 1966-70, the Bronco came with a Borg Warner driveshaft, from 71-77 they used a Spicer. 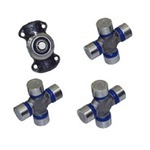 Both of these styles used constant velocity joints. If you're not sure, don't go by the year because many of the old ones have been upgraded already. An easy way to tell which one you have is to see if your driveshaft uses external snap rings (Spicer). If you can see the snap rings on the outside of the bearing cap, it's a Spicer. 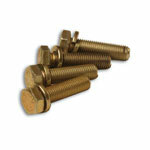 Another way to tell the difference is to measure the bolt pattern on the transfer case yoke. 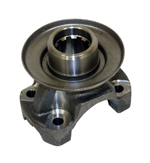 All of our driveshafts are Spicer style and you will need a transfer case yoke if you are converting from the old Borg Warner. Note: The working measurement is not the length of the driveshaft itself, but of the distance between the mounting yokes. The working measurement is taken with the Bronco sitting on level ground and loaded as normal. The rear usually measures 33 1/2-36" and the front 23-25". If your measurement falls between one of our sizes, We generally recommend you order the next larger size (e.g. Your measurement is 34" so you would order a 34 1/2" rather than a 33 1/2"). 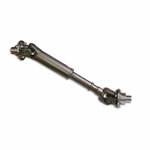 • A lack of maintenance is the number one cause of driveshaft failure. 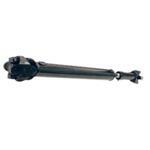 Driveshafts should be greased regularly, including the constant velocity joint and splines. 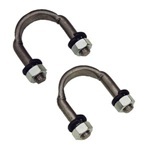 Most shafts will have a total of 5 grease fittings, so make sure you get them all. 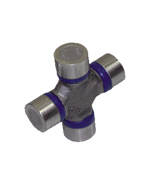 The grease fittings could be male or female style on the three u-joints and you will find the female style on the CV. 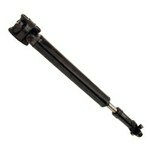 You will need to use a needle attachment on a standard grease gun. 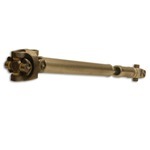 • A rebuild kit will not fix a driveshaft that has worn-out splines and slip yoke. 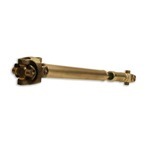 • An incorrect pinion angle will affect length. Make sure the angle is correct before you measure for a new shaft.